Water, water everywhere and lots of it. Tantangara is 30 plus percent highest it has been in over five years. Jindabyne is the same with water levels over sixty seven percent. Fish are starting to show themselves around the edges in both lakes. Lake Eucumbene is on the rise also, though not as high as the others yet. Rivers:- Only two and a bit weeks to go. Rivers reopen October 2nd 2010. Looking good for the opening with the Thredbo and the Eucumbene holding plenty of fish and good water flows. Lake Eucumbene:- Fly reports have been improving with some good silver rainbows around in many areas and little bit of polaroiding at times. Though the water level is not as high by comparsion to the other lakes the rising level will improve the fishing no end. *Ken Cain with the classic style of rainbow that are around at the moment. This one was caught near Buckenderra. Best areas to try would be Buckenderra, Angler's Reach and Seven Gates. Lake Jindabyne:- Jindabyne reports have been far better over the past week with some very nice fish and numbers of them of the rapidly rising banks. Best report was sixteen fish in a session on a cold, sleeting, miserable day that had fish bow waving in the shallows and were a sucker for any well presented fly. Other reports have been of some very well conditioned chrome rainbows and a couple of fat browns to six pound. Most of the better fishing has been daytime though evenings and early mornings are excellent times to be on the water. Lake Tantangara :- With the level of Tantagara now at a Snowy Hydro reported 33% the fishing up there has and will be fantastic. Access has been reportedly good and the fishing too. Cricket score catches loch stlye have been the norm and the bank fishing is improving with the high water. The lake looks a million bucks so any keen fly anglers should be getting up there as soon as possible. Though the water temp is likely to be cold there should be enough food items getting forced out of the ground to tempt a few fish in close. It has been five years since the lake has been this high. Eucumbene:- Eucumbene trolling reports have been good with some nice rainbows showing up in many areas and a few browns too. The browns are not all in great condition but the rainbow quality have made up for this for many. Boat launching is still very good at the Old Adaminaby ramp, Buckenderra and Angler's Reach. Jindabyne:- Trolling the edges has been fantastic with small minnows and tassies accounting for many fish. Hot pink Viking minnows have been excellent along with the rebel crickhopper taking a few fish. Drifting and casting back to shore in the early morning has been a very productive method with either soft plastics of small celtas too. Bait fishing has been outstanding in Jindabyne. Powerbait has been the major slayer though scrubworms have been working very well too. There was one report of some nice fish on mudeyes too, though as yet these are unavailable in store. Try Curiosity Rocks, Kalkite Rushes Bay or Creel bay. 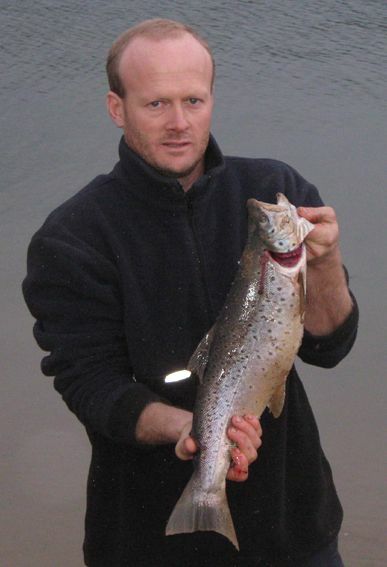 *Have been fishing Jindabyne late around the Weston's and the Clay Pits and have started picking up a few good browns. These fish have been in excellent condition and have been completely full of worms and yabbies, obviously because the lake has come up so quickly. Below is a photo of one of the good browns that weighed 2.27kg. The fish was caught slowly retrieving a scrubworm. 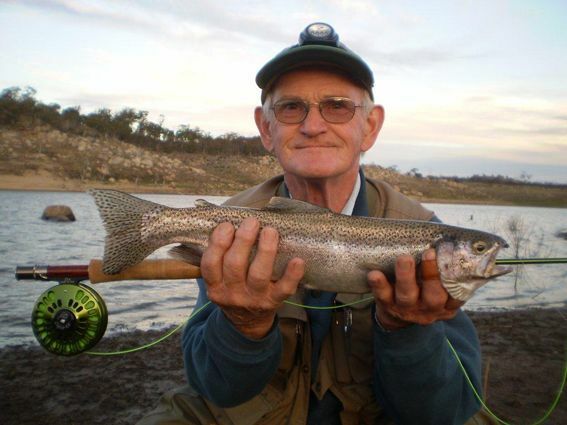 Eucumbene has also fished well with plenty of good fishing.